A guy came to our door today pushing a two-wheeled trolley groaning under the weight of the new Dublin Area and Golden Pages telephone directories. He dropped off a copy of each plastic-wrapped directory on our doorstep, proceeding to do the same at other houses along the street. The new directories are still in their wrappers: we're still figuring out if we can put the old ones in the recycle bin. It struck me what a ludicrous way to distribute information in this day and age. The vast majority of fixed line telephone owning households have the internet nowadays, not to mention mobile phones. A growing number (like me) simply phone one of the many directory enquiry services when they need a number - rather than flick through a user-unfriendly, already dated mass of irrelevant numbers and data in the form of a printed directory. It got me imagining a word to describe a business model that flies in the face of economic reality, and still keeps going. The best I can come with is 'dodonomics' i.e. : the provision of any product or service that relies on soon to be extinct production and distribution techniques. Or if you prefer: "if it didn't exist would anyone start a business doing it this way?" Of course there are lots of products and services that might fit the dodonomics model (though not the QWERTY keyboard, popular myth to the contrary it seems). The Golden Pages directory is really just an advertising medium of course. All those 'AAAA Plumbers Ltd' and 'AAAAA Skip Hire Ltd' advertisers probably do get some return on their advertising spend. But I'm not so sure about the rest. 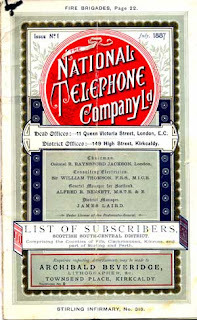 Consider: more and more households will disconnect their main line phones; move into gated apartments without easily access letter boxes; and face the prospect of paying by weight to have old directories taken away by refuse collectors. In a flourishing economic 'ecology' in which money is flowing freely from advertisers and consumers, then viable niches are created for 'quirkier' products and services. But once the climate shifts from the economic equivalent of moist rain forest to something closer to a northern pine forest then business extinctions follow. Look what happened to the dodo. Too right! I haven't used the residential phone book in a decade nor has anyone else under 30 that I've asked. Six were delivered to my apartment building of which four remain ten days on. Three flats are empty and this one has absolutely no need for either the phone book or the Golden Pages. I'm actually resentful of having to carry the bloody things round the back to the bins! Given that eircom actually have a revenue-raising directory enquiries service I would have thought it would actually be in their interest to remove the bulky phonebook (which is a close substitute) from the market, even if the displaced demand had to be shared with competitors. I just don't get it.